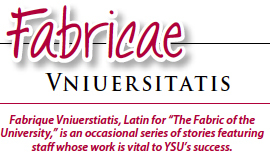 Melodie Provencher has been placing YSU students in gratifying jobs since 2004. She is an administrative assistant for the Division of Student Success on the third floor of Jones Hall. Although she has gone by a multitude of titles during her 11 years at YSU, her job focus has remained the same throughout. In addition to her position at Jones Hall, Provencher is a part-time faculty member, teaching English Composition courses during fall and spring semesters. After being hired at YSU, she earned a master’s degree in English, along with a certificate to teach writing and English as a second language. She also holds a bachelor’s degree in English Literature from Northern Illinois University, where she minored in Anthropology, and a certification in screenwriting from Washington University in Seattle. In her spare time, Provencher enjoys relaxing at home with her dog and playing Dungeons and Dragons. She says she likes how the game allows her to meet new people outside of work.